The above mug is Schoontiki, the creation of designer Christie Wright. It was created for a private art event, The Enchanted Luau, in New York City in 2001. Wright has a particular interest in the Dutch “schoon” principle of clean design. While the mug is impressive on many counts: beautiful graphic look, solid construction, interesting design — it is perhaps most impressive that this mug is a self-caricature, and pretty fairly represents the artist (who is actually quite lovely) while managing to look tiki. This rare mug (only about 50 were made) come up only very rarely on eBay, and they tend to go for big bucks. 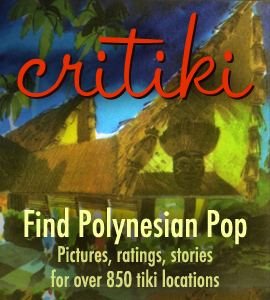 Bits and pieces of this have been known for some time, but there had been many questions about Schoontiki’s history, and these have been cleared up by a visit to Tiki Central by Christie Wright’s husband. Previous Previous post: Traders Restaurant Missing Its Doorpulls?